Robert Anthony Orsi. 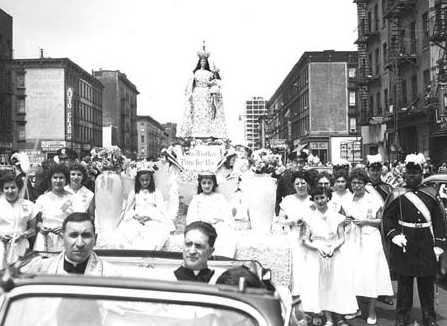 The Madonna of 115th Street: Faith and Community in Italian Harlem, 1880-1950. New Haven: Yale University Press, 1985. 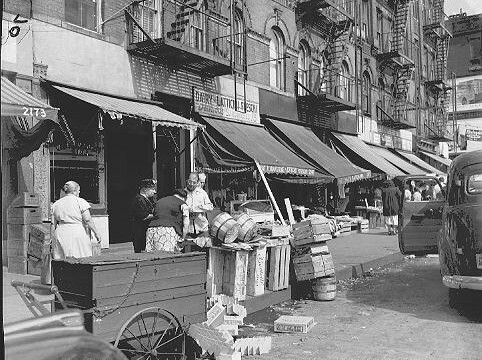 American Catholics frequently complained the Italians of East Harlem. 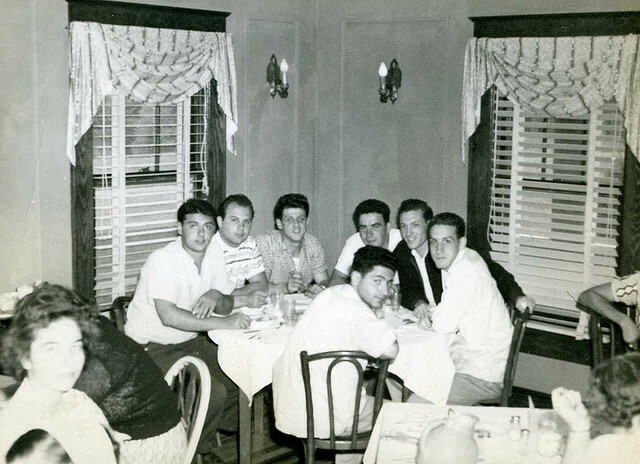 Their neighborhood was notorious for its mafia syndicates and was an immigrant quarter with overcrowded apartments and too many people who didn’t speak English. They only went to church for baptisms, weddings, and funerals, and rarely tithed and did not support Catholic schools as Polish or Irish Catholics did. But these people really were extremely religious, Orsi insists. For the purposes of this study, Orsi defines religion as “the totality of their ultimate values, their most deeply held ethical convictions, their efforts to order their reality, their cosmology.” And what lay at the center of the Italian cosmology in Harlem? Something Orsi calls the domus. He borrows this term from Emmanuel LeRoy Ladurie, who explains it as “at once building and family, the unifying principle that linked man and his possessions.” For the migrants in Harlem, the domus included one’s immediate and extended family, but also the food, customs, superstitions, and practices that they had brought with them from southern Italy. Orsi dedicates more than half of this study to examining the domus and explaining why it mattered so much to this community. To begin with, it connected them to relatives at home, and honoring the domus was a way of dealing with the guilt of leaving them behind. It also protected the neighborhood from untoward influences. Regardless of how powerful the mafia became, they were never a threat to the Italians because they respected the domus as something sacred. The unwritten rules of the domus protected unmarried girls from the advances of untrustworthy boys. Italian boys agreed that they would feel up as many American girls as would let them, but would never touch an Italian girl if their intentions were not completely honorable. Even having coffee with an Italian girl was tantamount to a marriage proposal. Most importantly, however, the domus protected the women who were simultaneously its masters and its slaves. In the words of Marie Concilio, a young Italian woman writing in 1940, a girl’s mission in life was to “help the mother in spoiling the father and the brother by waiting on them and by making them helpless around the house.” The crippling and tireless labor that this entailed took up all of a woman’s time and energy, but it also ensured her total power and absolute respect within the domus. 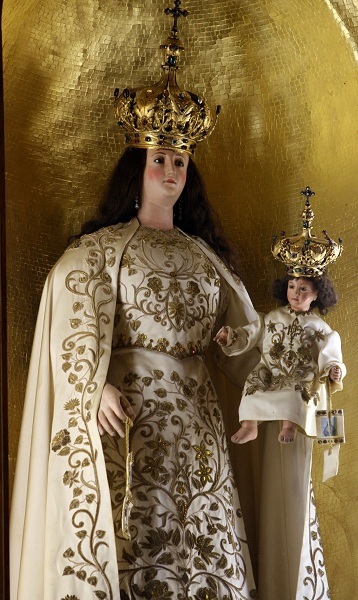 Women were the most dedicated participants in the cult of the Madonna of Mount Carmel. 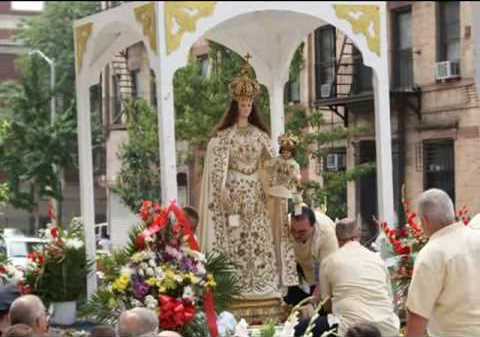 They were the ones who walked barefoot through the streets carrying enormous wax candles or accompanying the Virgin on her migration through East Harlem during the annual festa. If men came, and many did, it was because they wives or mothers made them. Some of Orsi’s richest sources are letters to the parish newspaper in which the faithful detailed prayer requests and miraculous interventions that they attributed to the Madonna’s intersession. In the seventy year period Orsi covers, only two letters clearly came from men. Women wrote about being saved in childbirth, their men recovering miraculously from work-related injuries, marital problems, and bringing sons home from wartime service. “Two months ago my husband was laid off after having worked in the same place for nine years,” one correspondent wrote in 1946. “I was so worried I didn’t know what to do.” So she made a novena and her husband got his job back. In grateful recognition of the Madonna’s aid, it was common for couples such as this to vow to participate in the festa barefoot for the next five years, to crawl to the shrine on their hands and knees, or to wear a blue sash (like the one worn by the Virgin) for the next couple of months, including when at work.